Herbed Ricotta and Roasted Cherry Tomato Bruschetta and an Honest Lemonade Giveaway! Herbed Ricotta and Roasted Cherry Tomato Bruschetta is made by topping toasted baguette slices with a fresh herbed ricotta mixture and oven-roasted cherry tomatoes. I've said it time and time again, I love appetizers. I could eat just apps and skip dinner and dessert and I'd be totally okay with that. 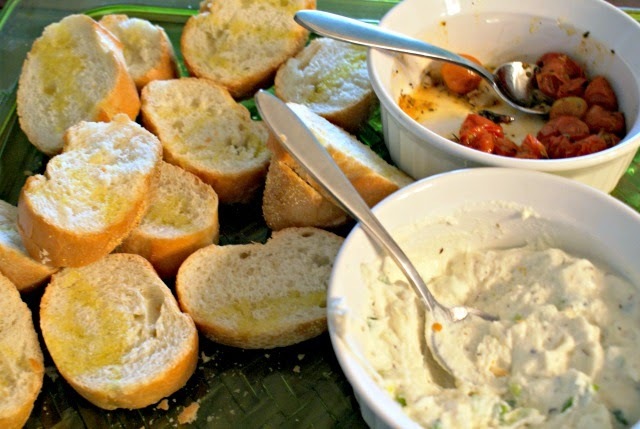 This appetizer is so incredibly easy to make and full of flavor. It's got it all...cool and creamy ricotta, fresh herbs, and sweet delicious garden fresh tomatoes all served on top of crusty bread slices drizzled with olive oil. Can't beat it. I love that I can use the cherry tomatoes and herbs from my garden to pull this recipe together. I wait all year for my summer tomatoes and I get so excited to use them in recipes like this one. I'm actually sad when summer comes to an end and I have to pay for tomatoes again. Like seriously, legitimately sad. If you've grown tomatoes before, I know you're with me on this one. Featuring the sweet tastes of summer, this really is the perfect choice for your next get-together. You can serve it like I did pictured above, where your guests can assemble their own little bites of deliciousness! Everyone will love it! Now that you have the perfect app for your next shindig, let me provide some cool drinks to go along with it! 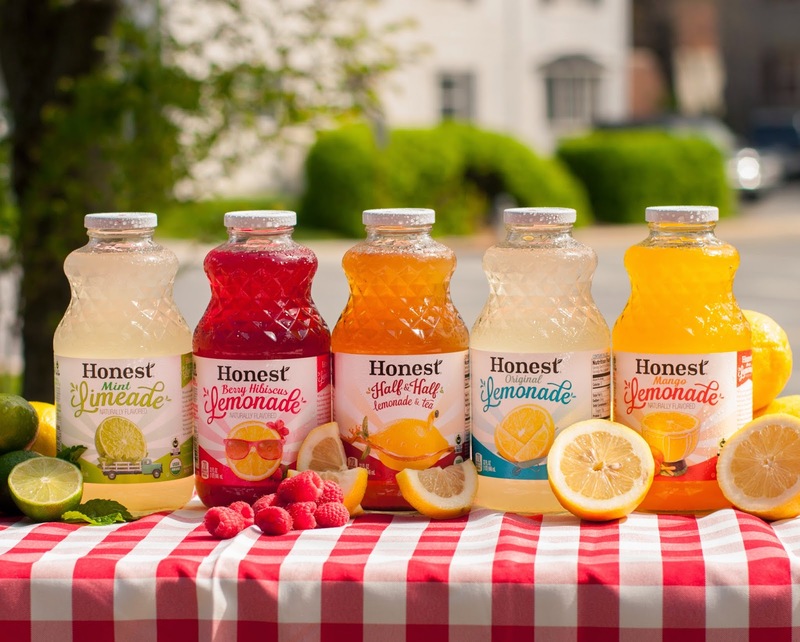 Enter now to win one of each of the Honest® Lemonade varieties! They are all made with an Honest® twist using organic lemons and sweetened with Fair Trade sugar to help our farmers invest in their communities. Perfect for summer sipping! 1 Classic Lemonade: Water, Lemons, Fair Trade sugar... and that's about it. The sipping is simple and easy. 1 Berry Hibiscus Lemonade: You don't need to see the world through hibiscus-colored glasses to enjoy this fruity brew. 1 Mint Limeade: Summerlime enjoymint. 1 Mango Lemonade: The mouthwatering mango flavor will have your taste buds celebrating like it's Carnival! 1 Classic Half & Half: Take a refreshing dive into this tasty lemonade and tea combo. Use the Rafflecopter widget below for 3 chances to win! Preheat oven to 450 degrees. Drizzle cherry tomatoes with olive oil and sprinkle with salt, pepper and brown sugar. Roast in the preheated oven for around 10 minutes, or when the tomatoes start to wrinkle and burst. In a small bowl, stir together the ricotta and herbs. Season with salt and pepper. 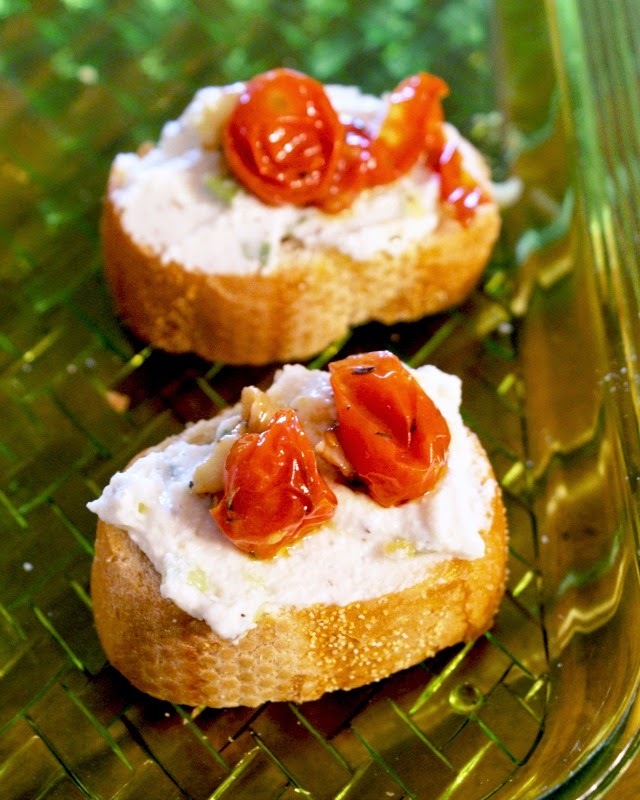 Drizzle toasted bread slices with olive oil, spread with herb ricotta and top with roasted tomatoes. It would be amazing to add some fresh garlic cloves to the tomatoes before roasting. Yum! Or, if you like a little kick, try adding a little sprinkle of crushed red pepper. Forgive the quality of my bruschetta photos! I know they're not the best. They were shot on the fly during a party! I would love to try all the flavones, but half and half or mango sound great! I know that I would be pouring the Berry Hibiscus first. Berries are a welcome sign of summer so that would be my first choice. The berry hibiscus lemonade looks great! I think mint lemonade sounds yummy! I'm excited about the Mango Lemonade. The Berry Hibiscus sounds soooo yummy! The Berry Hibiscus sounds absolutely delicious!! YUM! Mango is my favorite fruit so I'll go with that one! I would love to try the Mango Lemonade. The Berry Hibiscus variety sounds delicious. Id love to try the mint. We just started doing the infused water at home so I think this would be delicious. I think I'd most like to try the Berry Hibiscus Lemonade! I'd most like to try the Mint Limeade! I think the mango lemonade sounds really great! the Berry Hibiscus looks amazing! The Berry Hibiscus Lemonade sounds really good. Im excited to try Berry Hibiscus Lemonade. Yum the berry hibiscus lemonade sounds delicious!